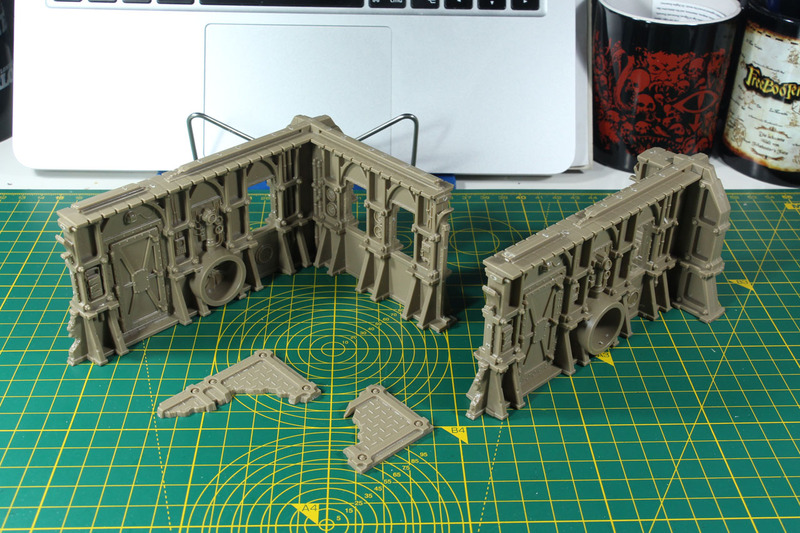 By that it is clear, that this is not just a terrain set, but an environment supplement for Kill Team. 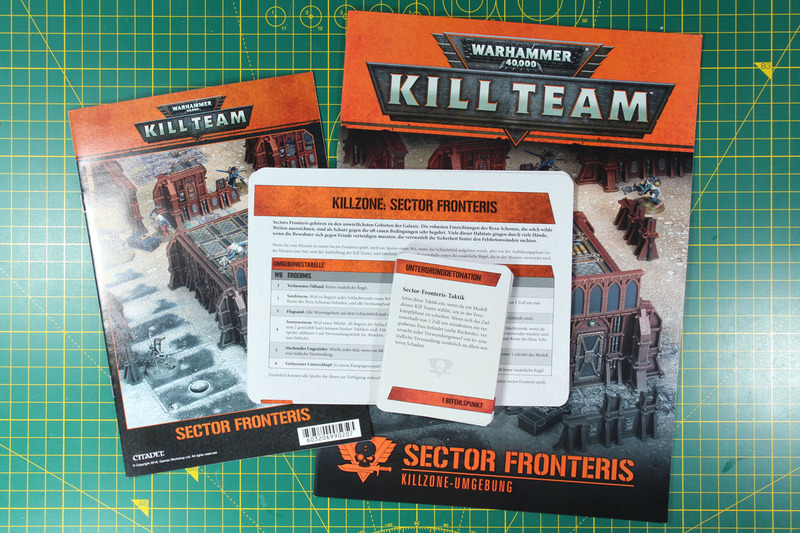 Therefore including a double sided thick card board gaming mat and additional gaming material, like an environment chart for the Sector Fronteris, 4 new scenarios using the terrain from this kit and new tactic cards. 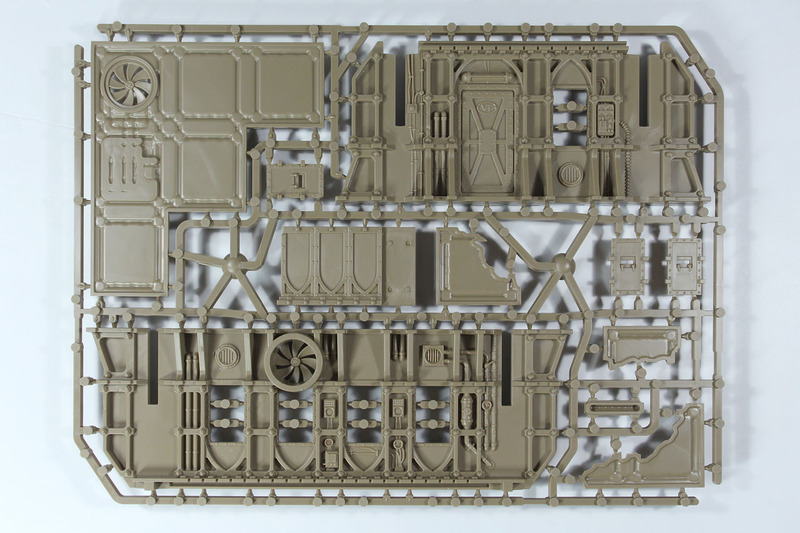 There are four large sprues included, two different types each two times. 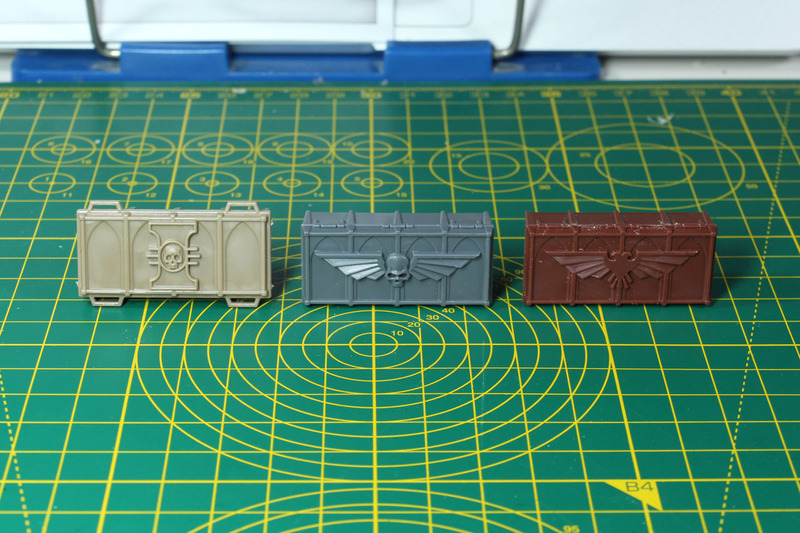 The sprues are precoloured in a brown/bone colour. 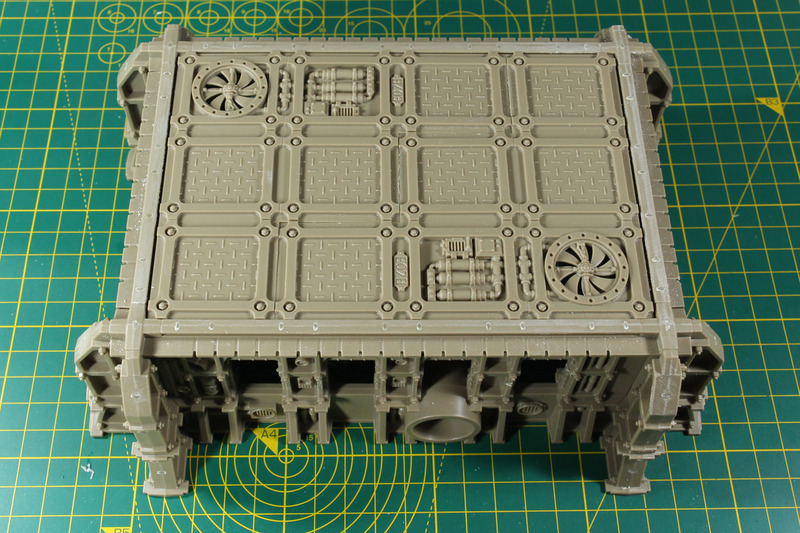 One of them, as mentioned above, is from 2017s Realm of Battle Moon Base Klaisus, the other one, covering floor / roof tiles for the first time for the Ryza type buildings. 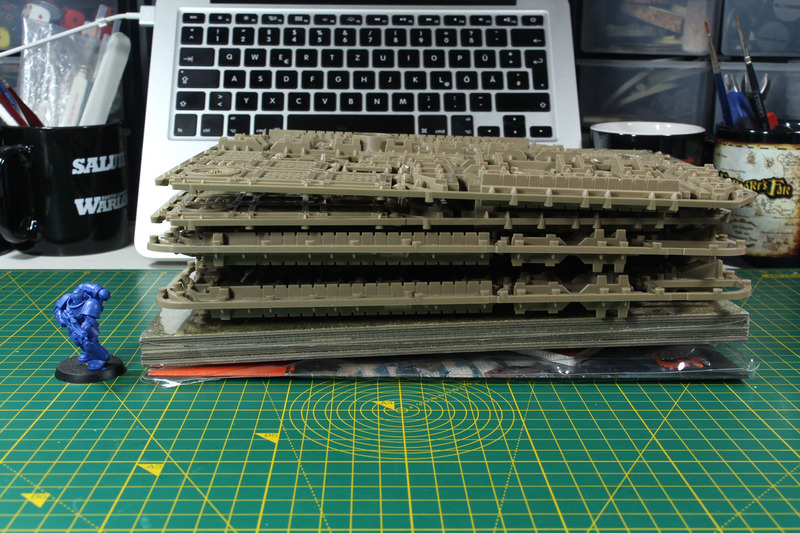 Casting is good, it just takes a bit to clean all the sprue connections. But that is something that is due to the conditions of manufacturing. 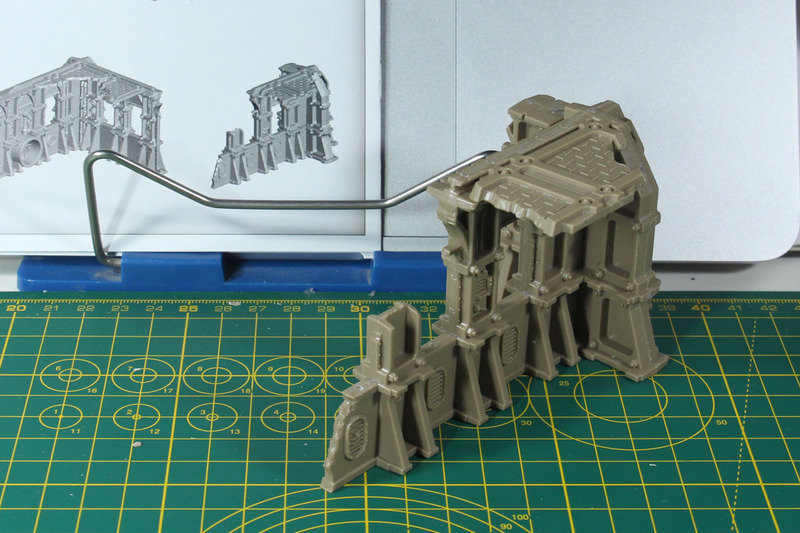 If you want to have parts as thick as the walls with injection moulding and that level of detail, you need a lot of infusion points. But beside that, mouldlines are easy to clean, as the surfaces are mostly levelled and easy to reach. 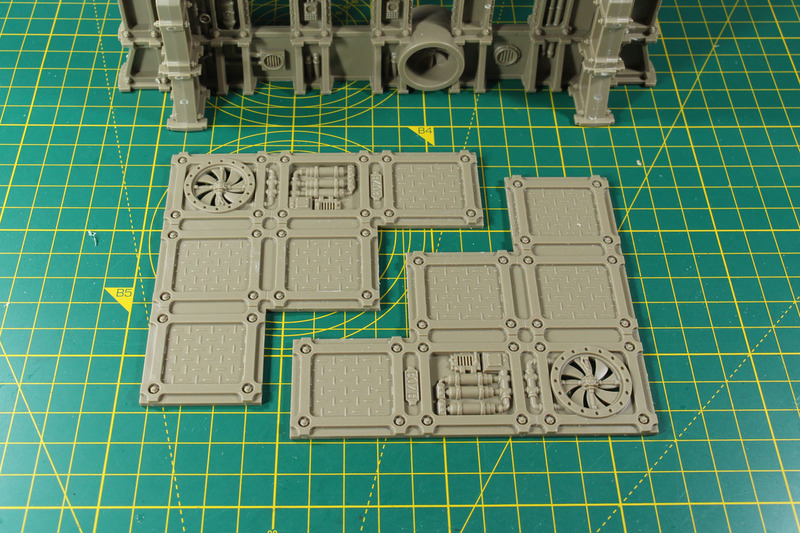 The sprues give you these wall pieces twice. They are assembled by an easy slide-together connection system, some have the plug connection on the top, some on the bottom. 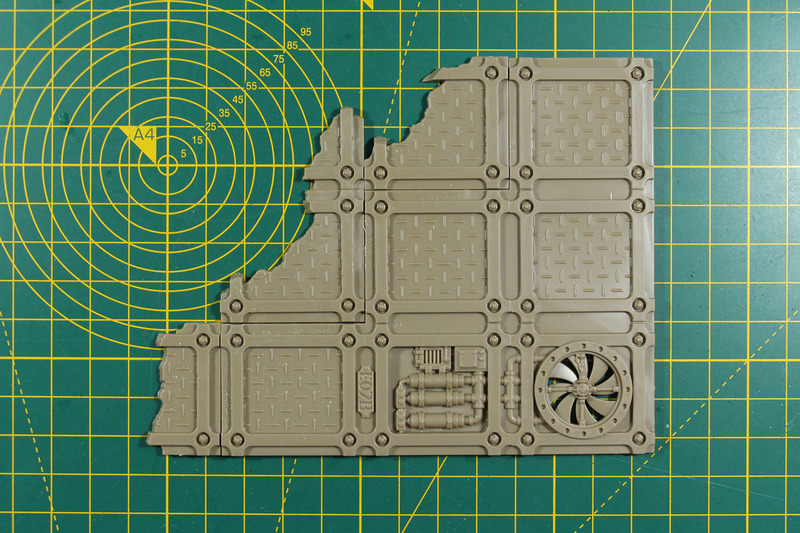 The walls come in intact and broken down parts and can be mixed (only in limitation to the connection slot). 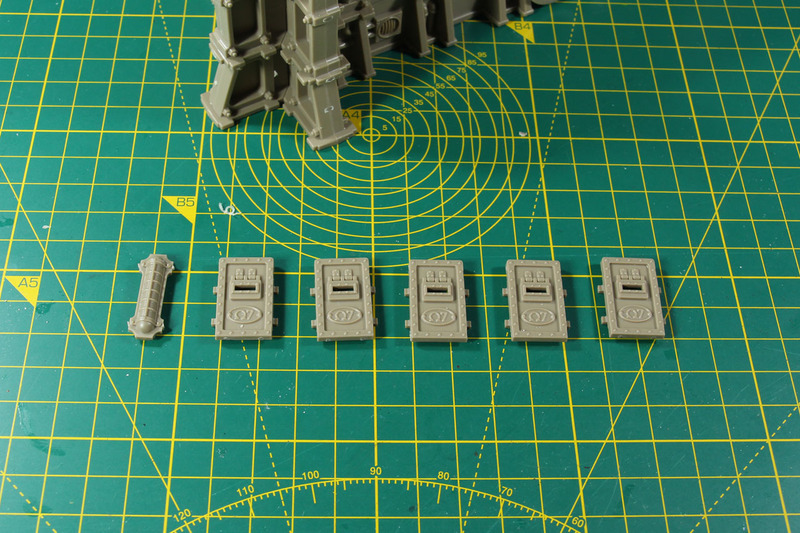 Of course these are compatible with the other Ryza pattern sprues. 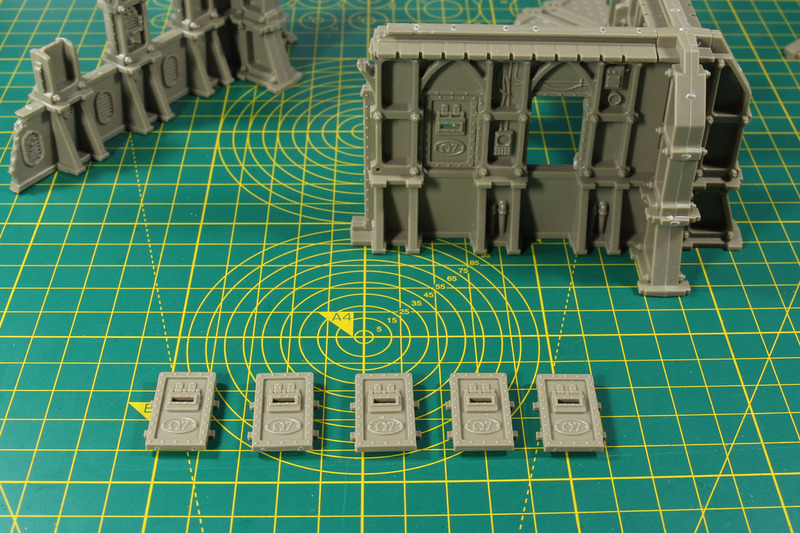 The Sector Fronteris assembly instructions suggests building the parts into 5 buildings / ruins. We begin with the first two using the broken medium wall. 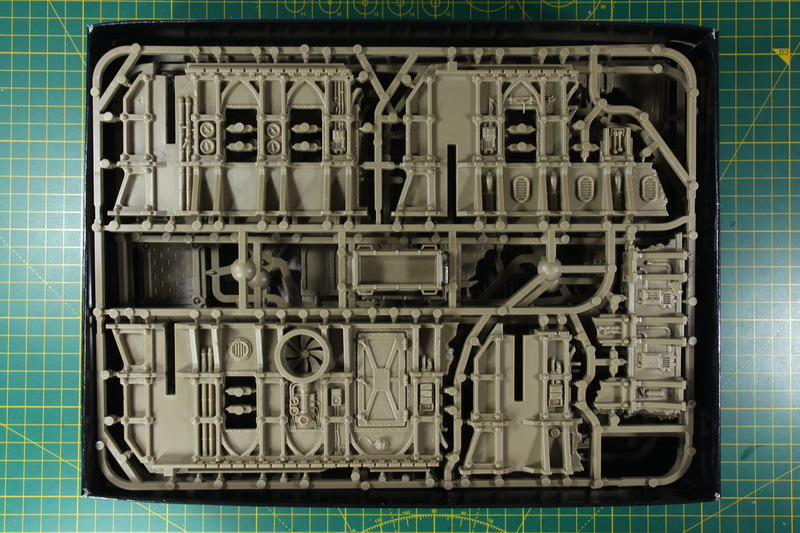 On the back of the packaging you find alternate layouts for the parts included in this kit. 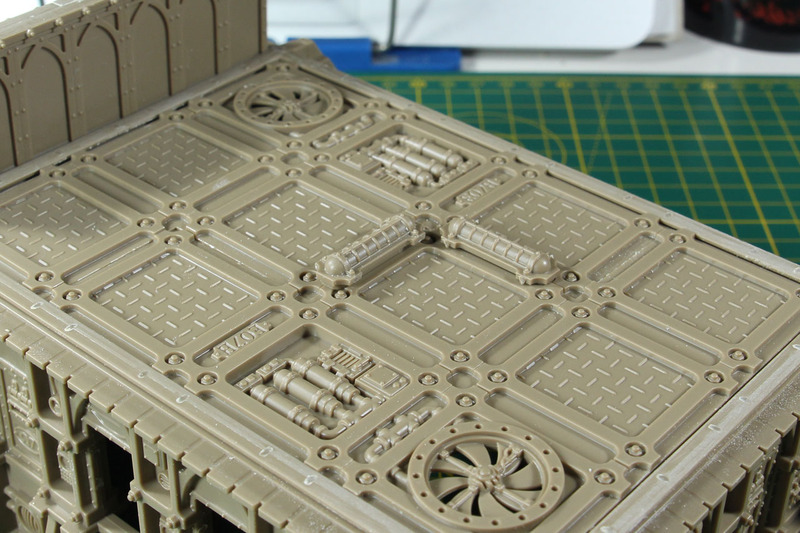 New additions with this kit are the roof parts in the new sprue. 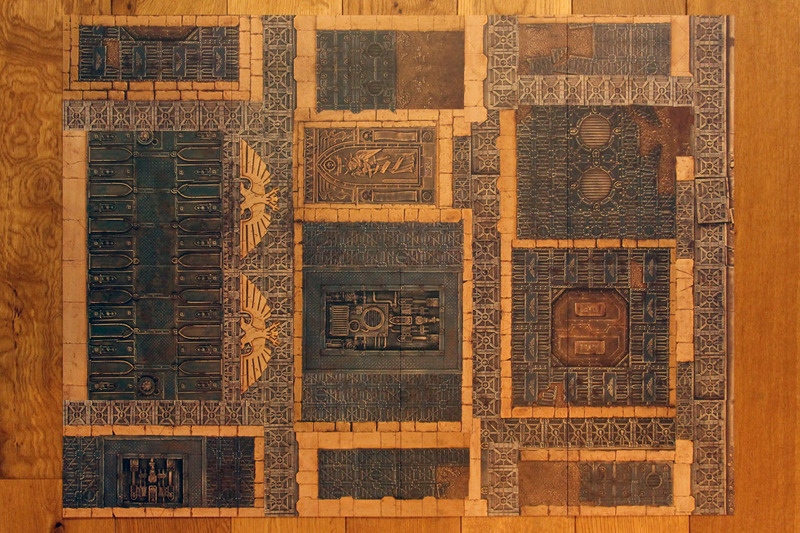 There is a large 6 tile piece and three different broken tiles. 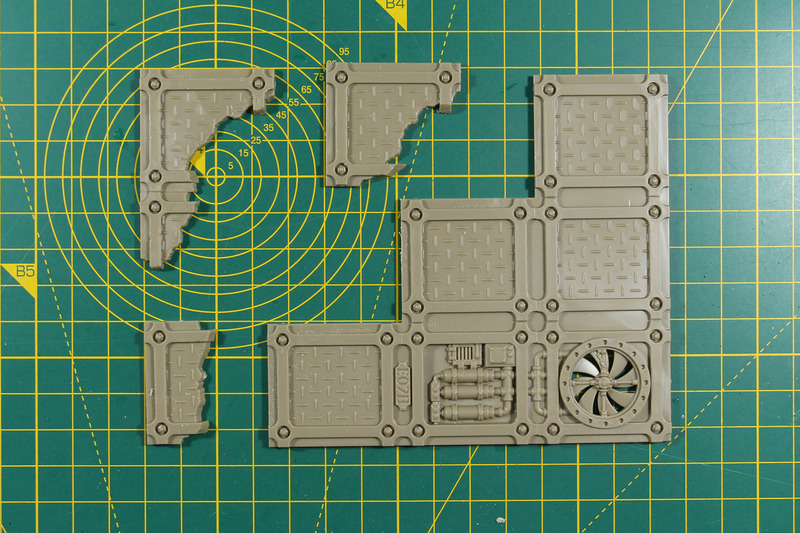 As each of the sprues is included twice, you get double the amount shown in picture 1 and 2. So you can build a full floor like shown in picture 3. 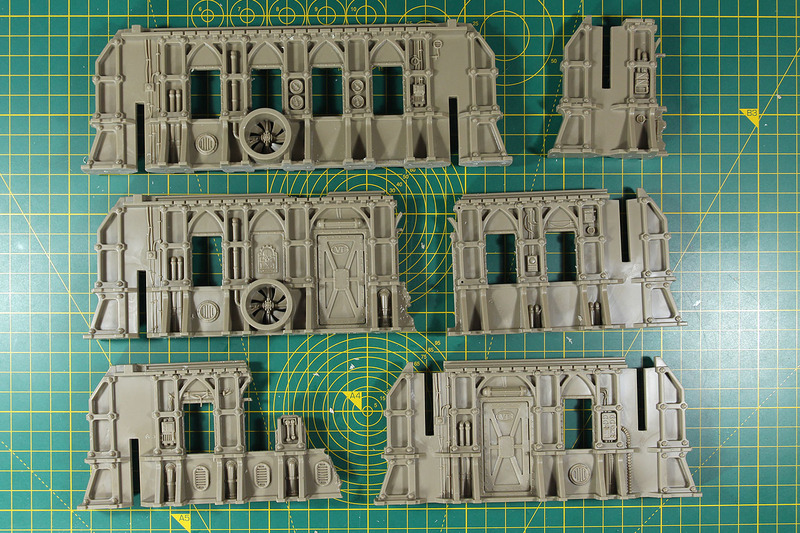 Now adding to the wall pieces the ruined roof tiles, along with the window shields. There are a total of 6 in this box and you can add them from both sides to the wall. Just a pity, that they only come in one design (numbers and Greek letters are the same on all of them). As the surface on top of the wall is slightly sloped, you will need to support the roof pieces, for them not to bow down while the glue settles. 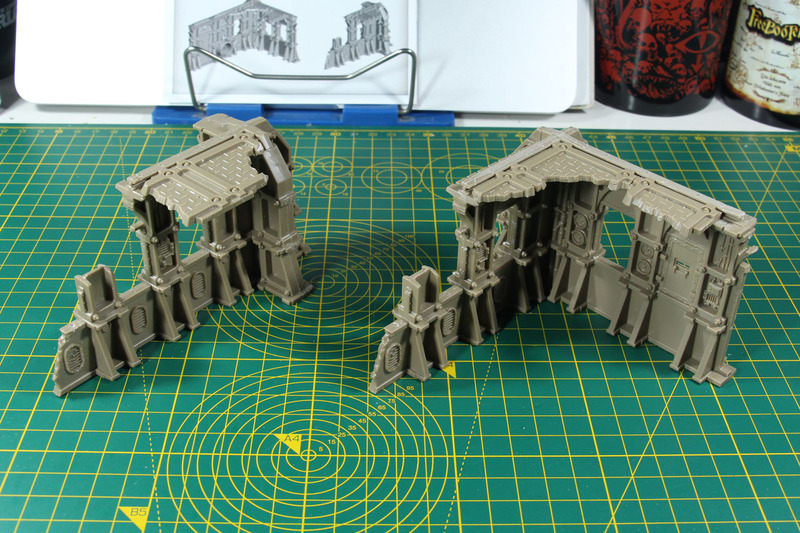 I am a bit irritated by this ruin piece, as the roof tiles are added onto the outer walls. Of course you can "fix" this by swapping the orientation of either the short wall piece or gluing the roof to the other side. Now for the medium sized wall pieces. Again, very simple assembly. These only use the roof pieces on the larger ruins of the two. The largest piece of the Sector Fronteris boxed set, is the intact building. I turned one of the walls by 180°, as I wanted to have different designs around the outside. There are two smaller, individual ruined wall pieces as well. This building is closed and receives a full roof, that is build by gluing the larger roof tiles together. There is a bit of clearance along the edges, as the frame for the roof is larger than the roof piece itself. I tried to centre it as far as possible. The roof receives a building sign, that reminds me a bit of the western buildings. 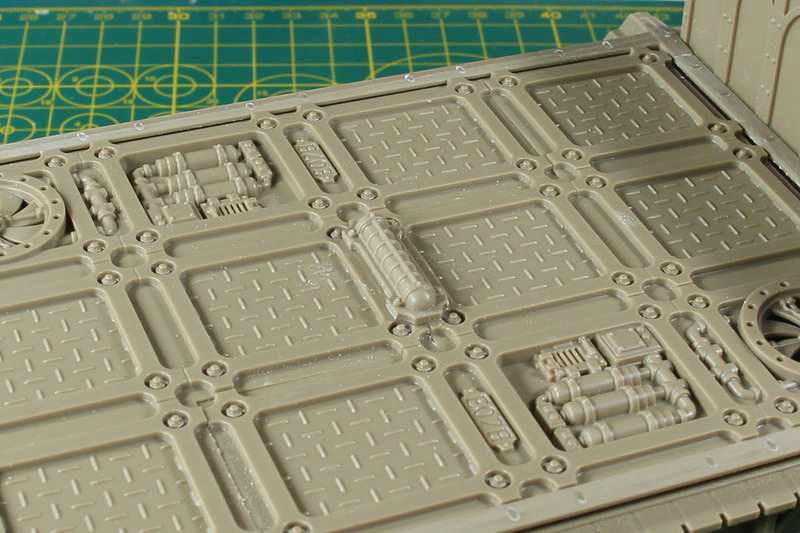 This comes from the new sprue as well and is made from two identical pieces, interlocking on an L-shape girder. Again, as the upper parts of the walls are sloped, you need to keep an eye on the parts while the glue settles, for the sign not be inclined. There are few bits still available for customizing the building. There are lamps and further window shields. The lamp is shown in the instruction to cover the connecting area of the two roof parts. Only problem, it doesn't fit, as the tiles are rectangular and not square. They fit on the long but not the short side of the tiles. If you want to add them as shown in the instruction, you have to cut off the oval guide on the bottom part. I added the remaining window shields to this building, as I thought it made more sense to use them on an intact building. 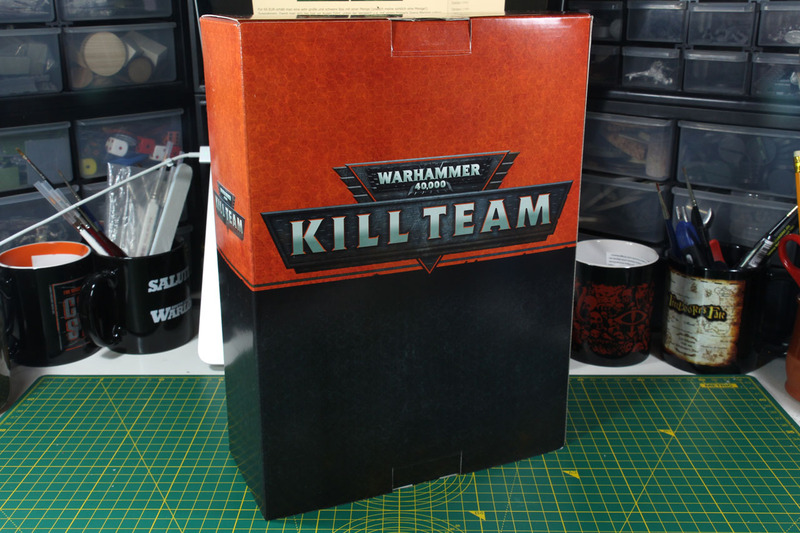 This kit comes with another type of crates, this time with the Inquisitor insignia on top. 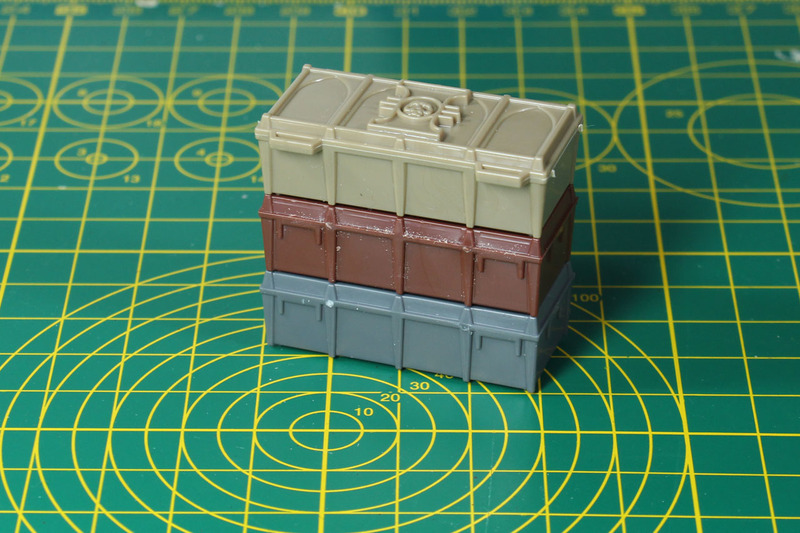 It is the same size as the crates from Armoured Containers, Mission Objectives or Rogue Trader kit, and they can be stacked. But the Inquisitor crates have to go on top, as due to the size of the insignia, you can not stack other crates on top of them. 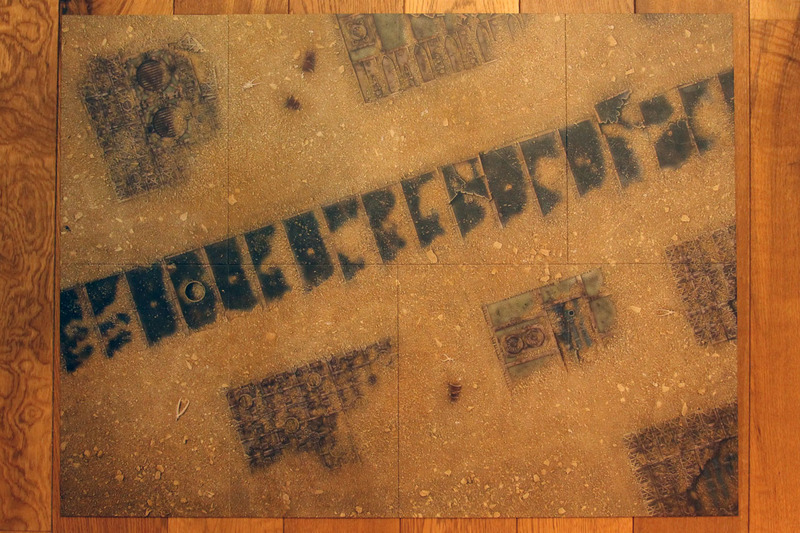 Similar to the other Kill Zones, this set comes with a 22” x 30” game board made from heavy cardboard. It is two sided and covers the imperial city on one side and an imperial border region on the other. 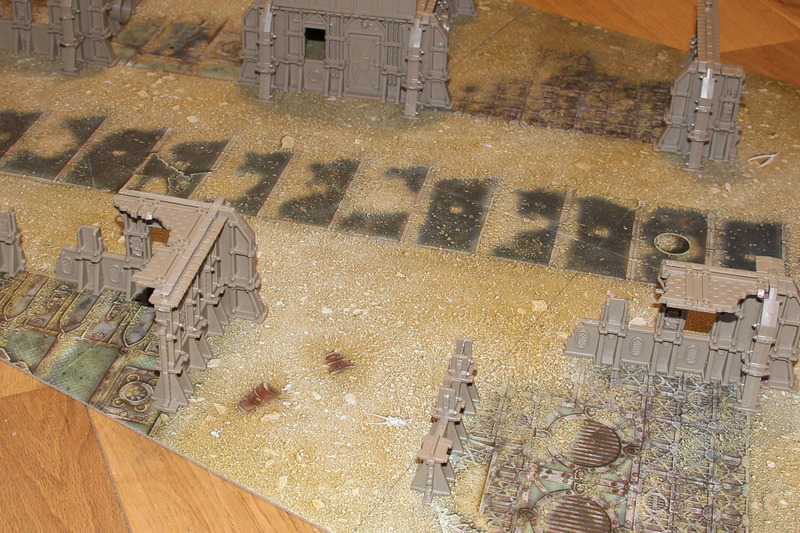 The city side can be combined with the other Kill Zone boards, for a larger game board. That could be useful while in use with cityfight rules like Urban Conquest. 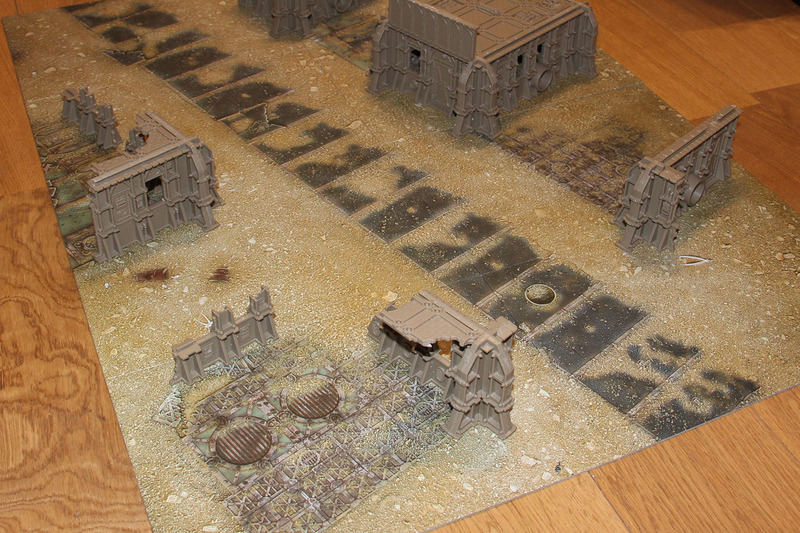 And the board looks like this, if you add the buildings. 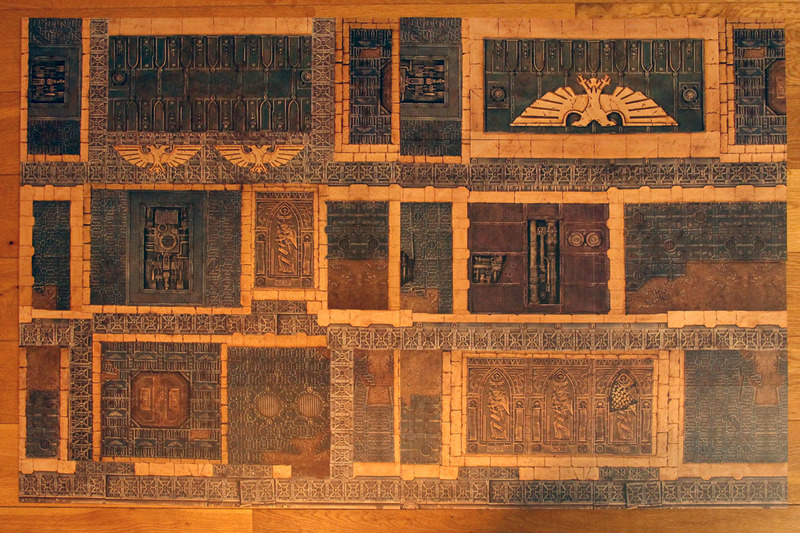 Please note, this is a new gameboard and not the Moon Base Klaisus reused. 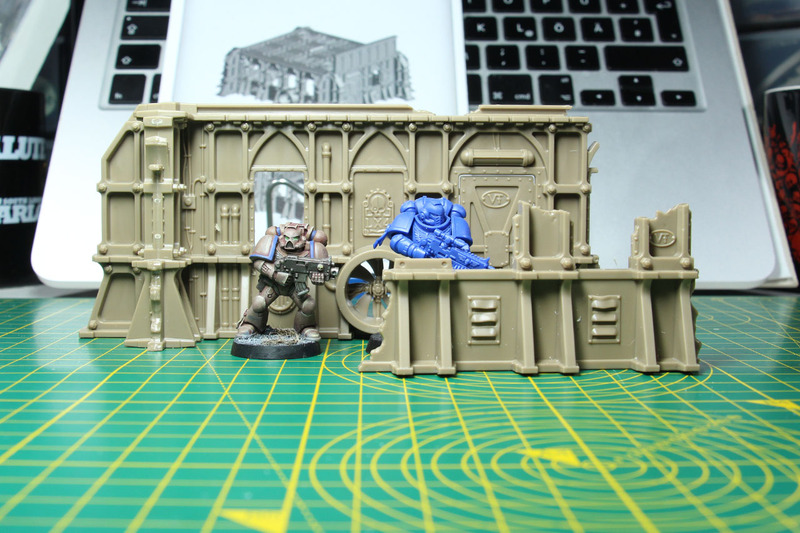 As for size comparison, the walls are sturdy and high, and provide proper cover for larger infantry miniatures from the Warhammer 40.000 range as well. 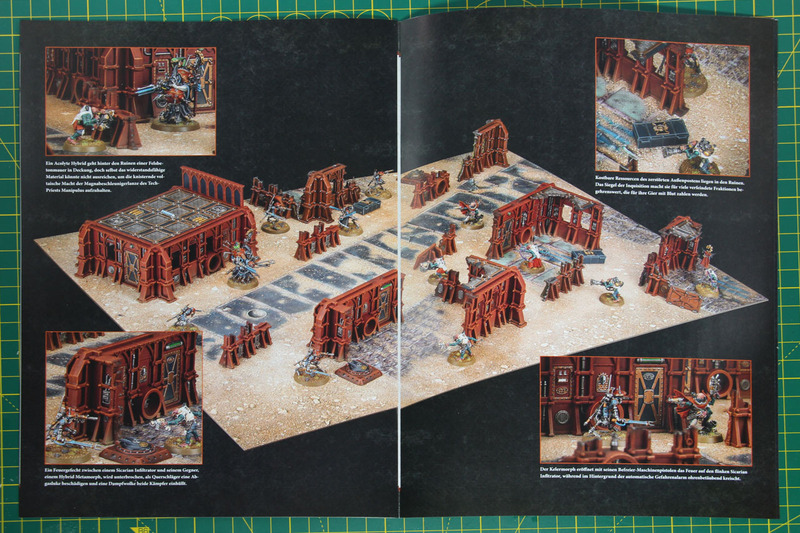 In the booklet, that comes with the Sector Fronteris kit and that provides a bit of lore on the Ryza pattern buildings, is a picture shown using the Sector Fronteris kit along with the two matching Kill Teams (Genestealers vs. Adeptus Mechanicus), who add the smaller Ryza pattern ruins to the collection. If you have no use for the Kill Teams, but would like to extend the Ryza pattern, I suggest the STC Ryza pattern ruins kit. 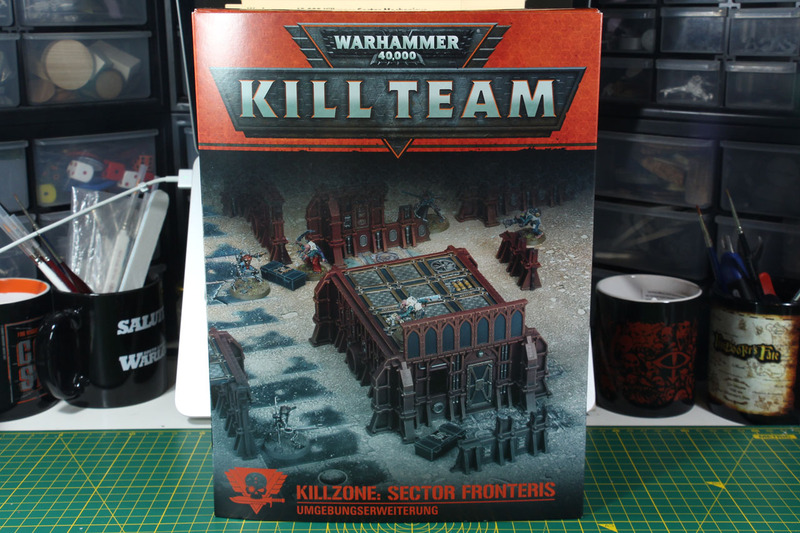 The Killzone Sector boxed sets are usually a no-brainer, as you receive quite a lot of terrain for a very solid price. If you buy them from an independent retailer with a bit of discount, you easily have savings of around 50% compared to individually buying the content. 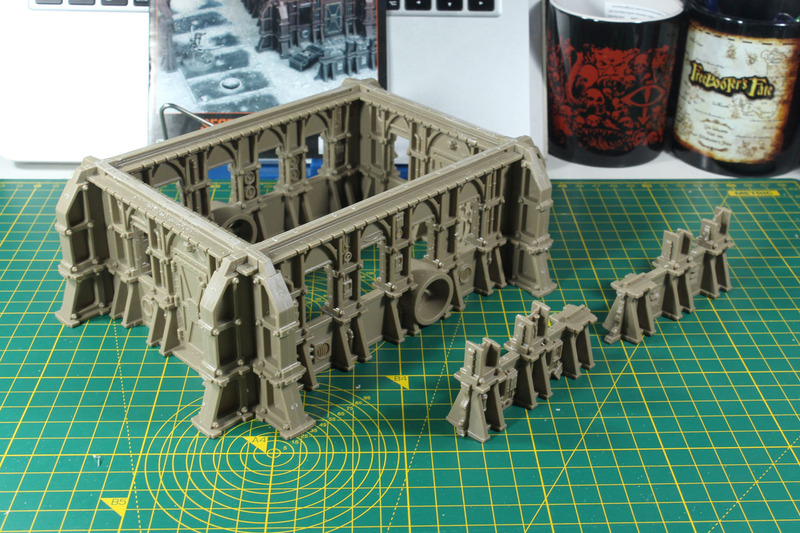 The Wall of Martyrs was a bit of a let down on the bargain side as you saved only 17 EUR, compared to the superb deals of the Sector Mechanicus, Munitorum or the Death World Forest. 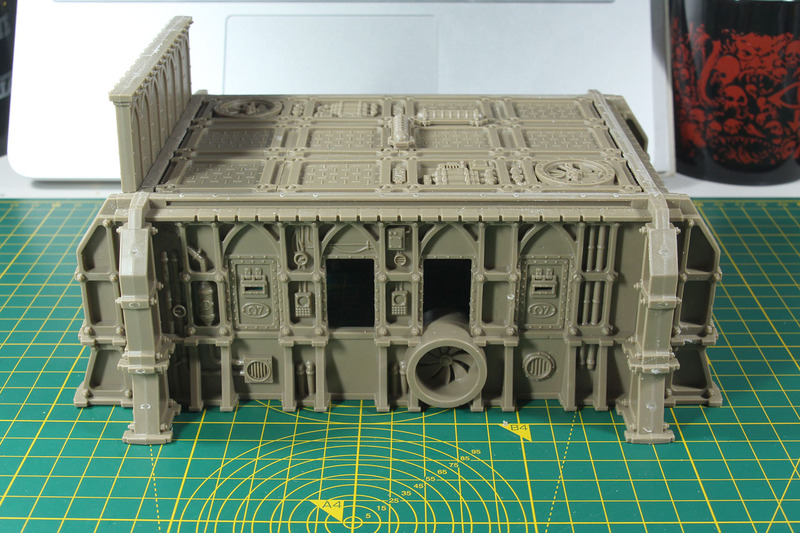 As mentioned above, it is a bit tricky, to calculate the savings on this one, as there is a new sprue that currently isn't available on its own and the other sprue is only available through the Moon Base Klaisus. Compared to the larger amount of sprues in the other kits (usually 8+), the 4 in this one feel a bit low on the content part. 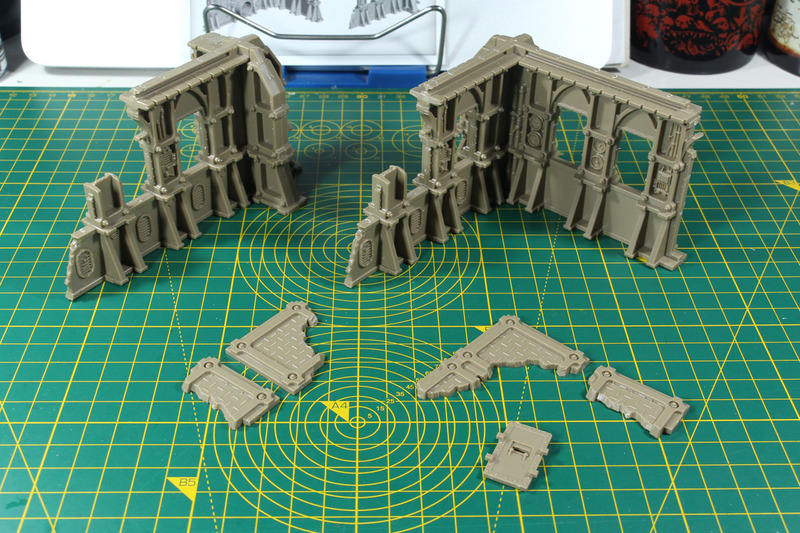 If a pair of the Ryza Ruin sprues was added to this kit, the overall buyers experience would match the other kits better. 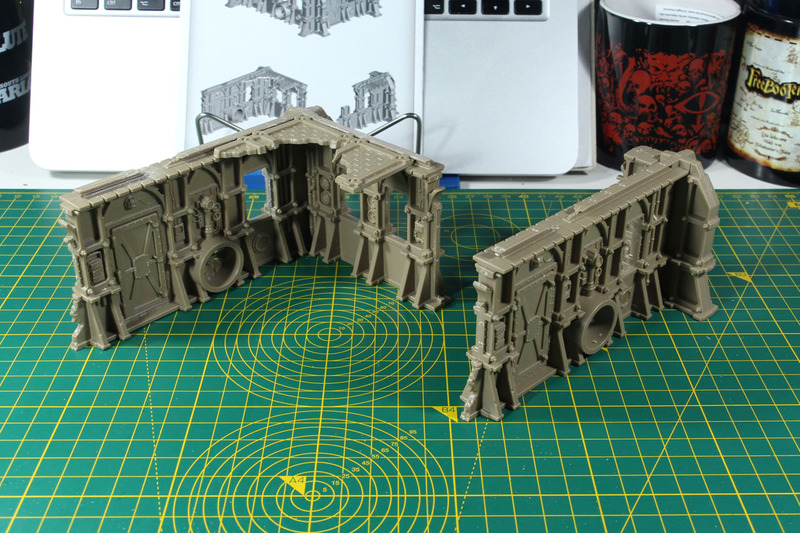 Depending on where you first saw this kit mentioned, for example on Warhammer Community, it is shown with the additional sprues from the Kill Teams, so that might confuse the customer thinking that all of the terrain would be part of this kit. But maybe the "problem" is, that Games Workshop started too strong with the other kits, with deals with too much of a saving, and it is difficult to keep that up. They raised the prices on paints and some of the Getting Started kits with the beginning of this year. So maybe cutting a bit of the content is another way of dealing with a price rise, but keeping the Killzone sectors on the same price tag. 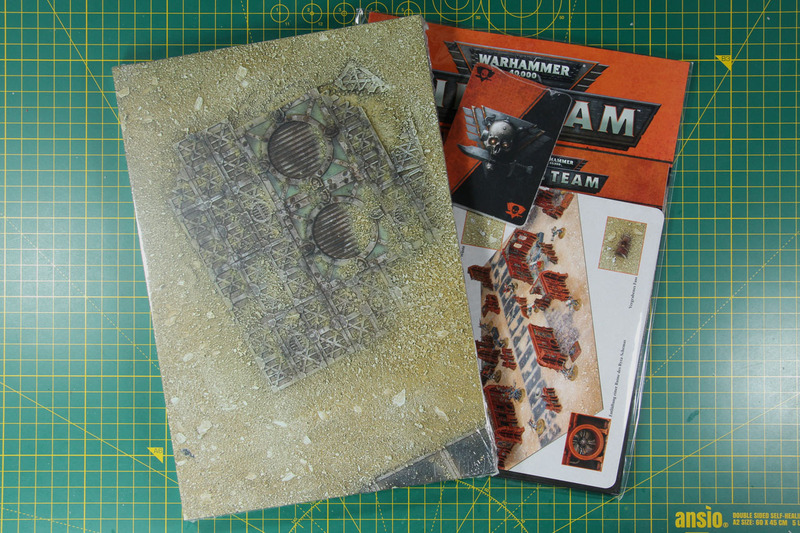 Still, compared to the Moon Base, this kit has better value, and if you add the Ryza Pattern ruins (or have both of the accompanying Kill Teams), you are pretty round with it. 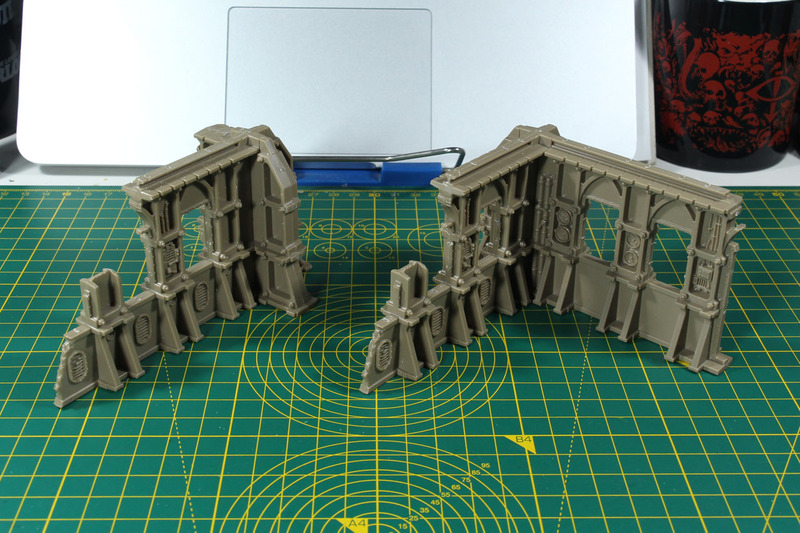 If in doubt, get a second Sector Fronteris and alternate the assembly, as you can get quite a lot U or C shaped ruins out of the sprues, if you do not choose to build the intact building. 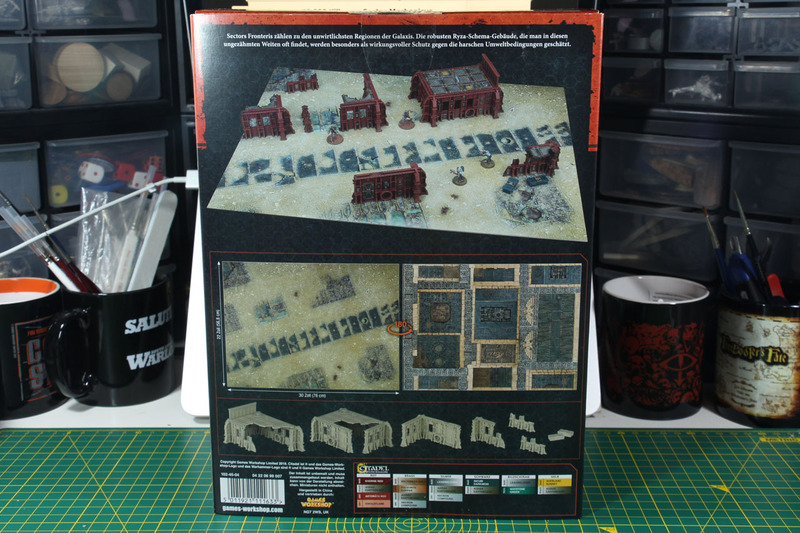 This boxed set is reasonably priced and provides you with a good amount of terrain. 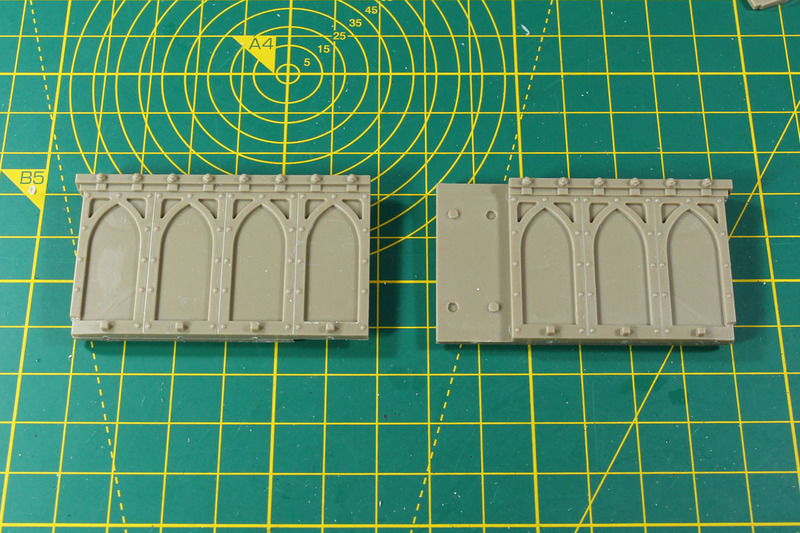 Assembly is easy and depending on how you add the roof tiles, you could keep them modular / variable, as you do not need glue to assemble the walls. So from that point of view, even with the aspects mentioned above, a solid product. 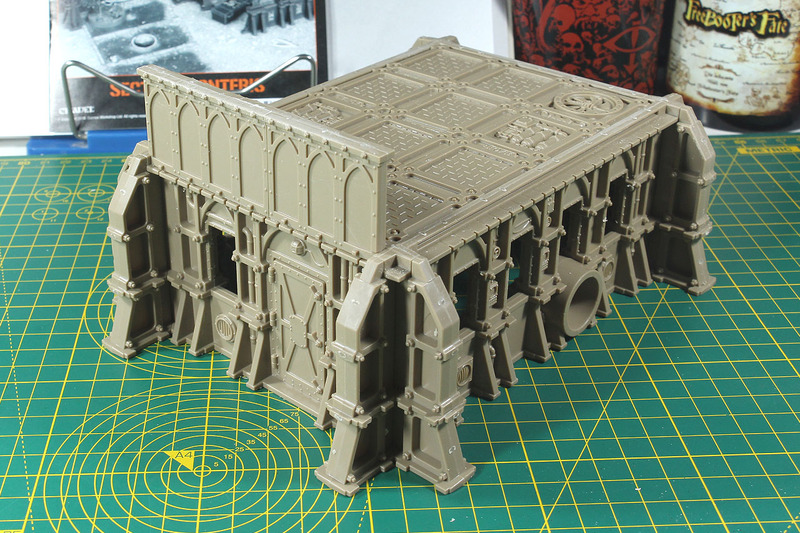 For my taste, they work very well for city fights, as you get the walls, but still are very playable as you do not have the height of the larger ruins. So these can be used with regular Warhammer 40.000, Kill Team of course and rule sets like Necromunda or Inq28. 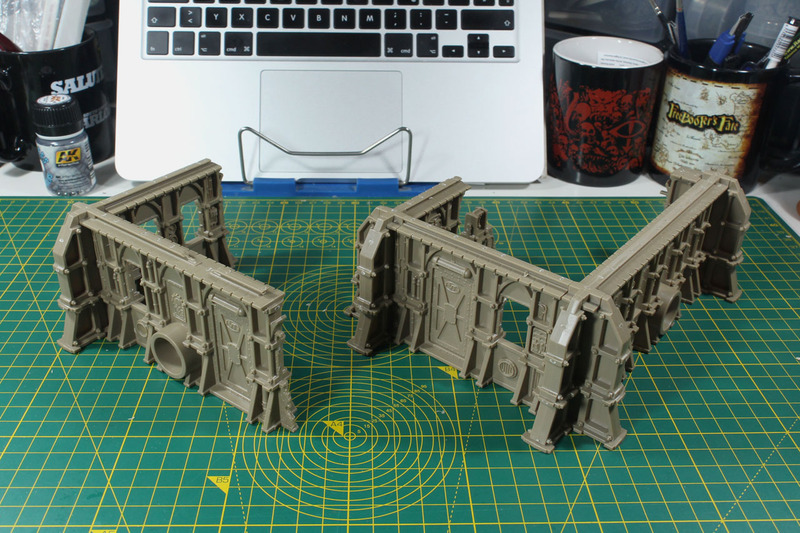 Depending on how creative you want to be, these can be a cheaper option towards the Zone Mortalis, if you don't have the budget for the Forge World kits or do not fancy a resin kit of that size. Warhammer 40.000 and Kill Zone are brands by Games Workshop.